Our family-owned shoe factory in Allentown PA. has been shuttered for decades, but memories of the once booming business lingered with me for years. In the late 1960s my parents and I visited the lone remaining factory of my family’s once burgeoning business, Dr. Posner Shoes that my great-grandfather Abraham Posner began in 1888. The noisy factory once the very model of modern mechanical and managerial efficiency was by 1968, dark and grimy, the air redolent of leather, oil and solvents of a dubious nature. By the time I visited the factory the business was nearing the end of a good 80 year run, the optimism in the workplace had faded as much as the antiquated motivational posters that still hung on the walls, dim reminders of a by gone day. The collection of dozens of different bold colorful motivational posters fascinated me. These large colorful graphic expression of Good American work ethic were not unlike the guides to good mental health we had hanging on our bulletin boards at school. 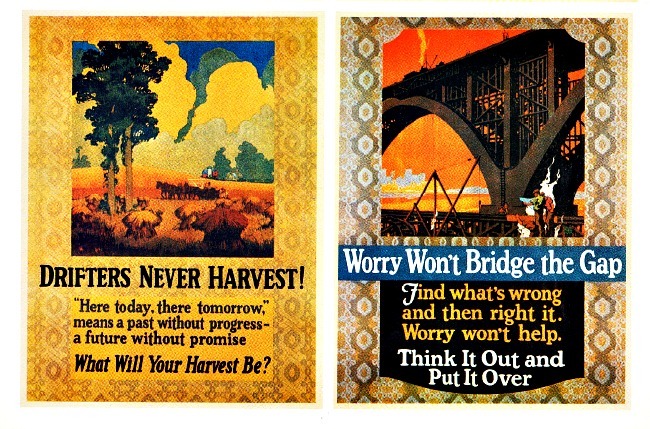 With uplifting texts sprouting advice such as “No jobs done till it’s all done”, these posters that hung in hundreds of factories and businesses across the country were an amalgam of Dale Carnegie homilies on how to Win Friends, and the Power of Positive Thinking as espoused by Norman Vincent Peal. The posters predated them both. The placards produced from 1923- 1929 hailed from the booming ballyhoo world of the roaring 20s when everyone was very boosterish on business. Those nearly 7 years saw year follow year of unprecedented prosperity. If, as President Calvin Coolidge said “the business of America is business” then the businessman was king. The business man of the era of Coolidge prosperity saw themselves as men of vision with eyes fixed on the future. 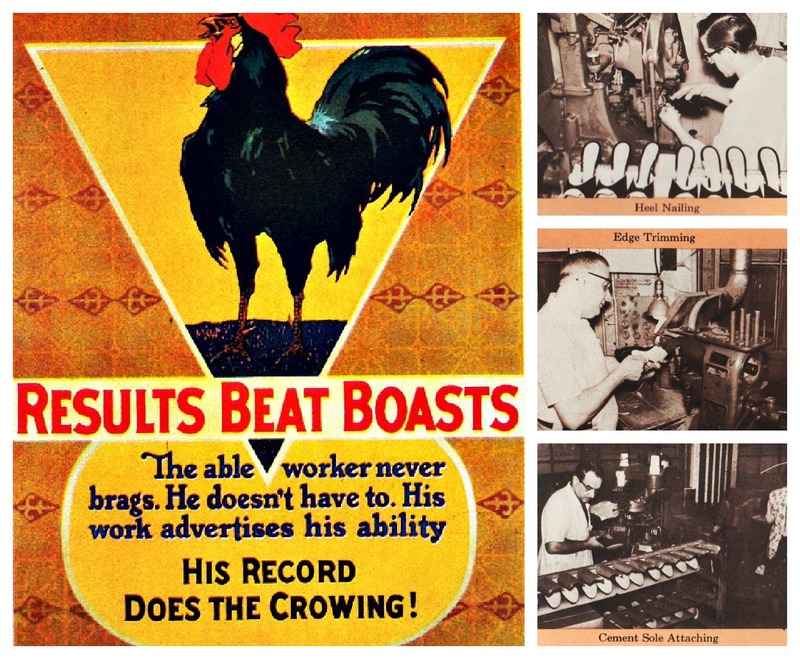 Hoping to inspire greater productivity and mold his employees into the ideal worker, my up to date Great Grandfather offered incentives such as reduced hours, higher wages, and comprehensive health care. But with the stirring of socialists, strikes and unions looming in the distance, Grandpa needed that extra something to ensure employee loyalty. His solution came courtesy of a beefy, congenial traveling salesman from the Mather Poster Company in Chicago. 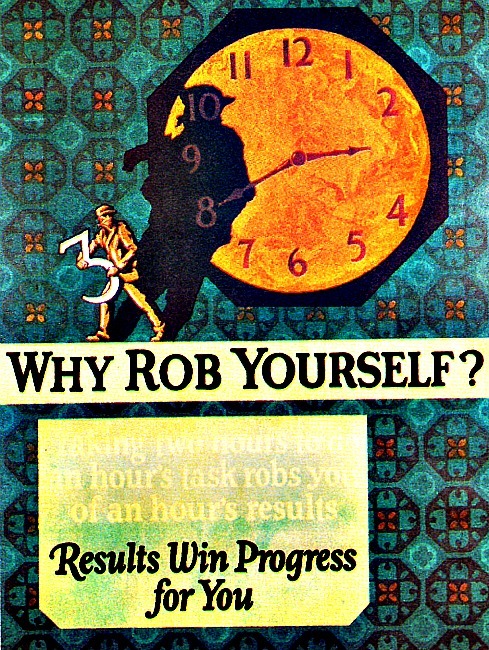 Mather’s produced work incentive posters to motivate employees. 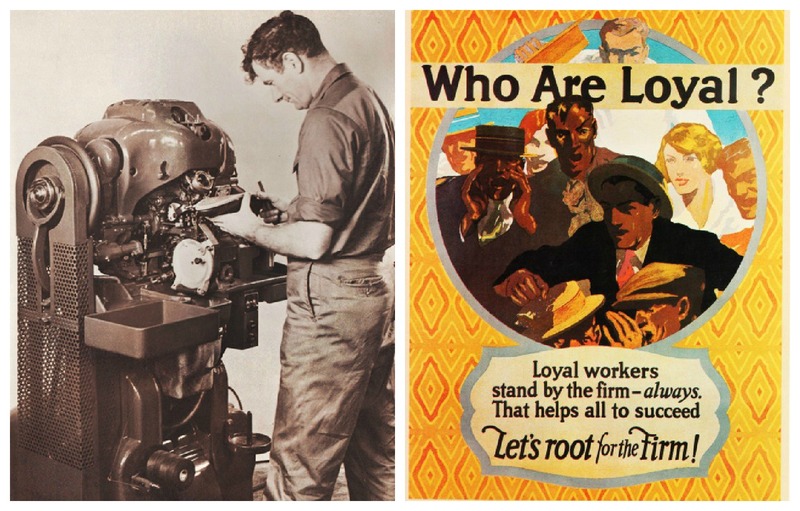 These bold colorful lithographic posters with attention grabbing images and snappy slogans were designed to improve worker productivity, reinforce morals, and curb turnover. 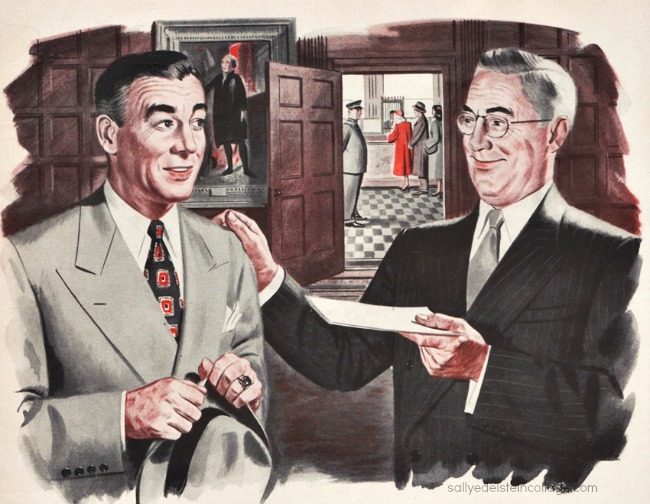 With a ready handshake and a sales catalog as thick as his Chicago accent, the salesman, Mr. Ned Shockley explained to my Great Grandfather just how the posters worked. The catalog organized the posters by theme with cautionary categories ranging from laziness, responsibility, efficiency, mistakes and rumors to fire prevention and practical joking. 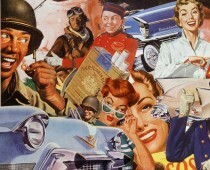 Employees would change the 44 x 36 inch posters weekly based on either current events or factory problems. Then thrilled by the first few posters, the happy worker would wait with bated breath in anticipation for the next poster in the series as eagerly as they waited for a serial movie on a Saturday afternoon. Mr. Shockley painted a rosy picture of earnest workers holding discussions, memorizing snappy slogans and creating a team effort. The catalog referred to the worker as someone who clearly needed to be molded. “Equipment doesn’t think- a man does think- therefore workers must be taught to think right.” Mr. Shockley read out loud. Glancing at one of the sales brochures, Grandpa was further intrigued. 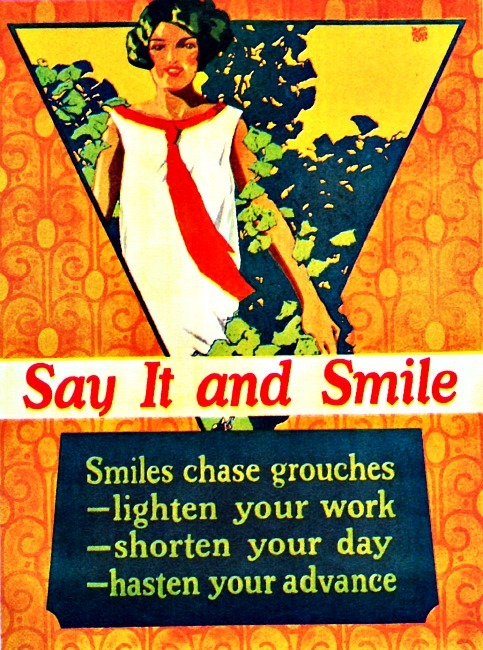 Mather Posters promised to “Stop Losses and Build Large profits For you”. Clinching the deal, the smiling salesman let it be known how wildly popular these posters were. 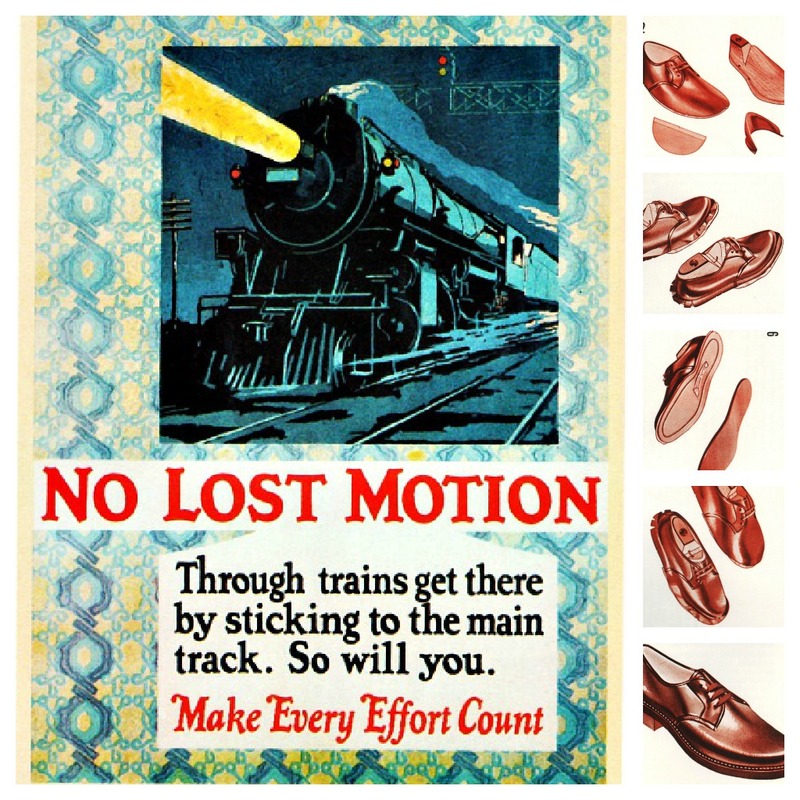 Dr Posner Shoes, he assured Grandpa, would be in excellent company joining the ranks of such big American names as General Motors, Kellogg &Co and Kodak who enjoyed the services of Mather Posters. Any thoughts of unionism, picket lines, or worker unrest would be immediately extinguished in Grandpa’s mind once he glanced at his Mather filled walls in the bright factory bringing to mind visions of peppy employees saying it with a smile, staying on track and rooting it for the firm. They were surely the sort that George Babbitt would have approved of. Where was this factory in Allentown? A few years ago, I lived in the Farr Lofts, which were located in a converted shoe factory. I’m curious if it’s the same factory! I honestly don’t know the exact address, as my visits were as a child. There were several other shoe factories in Allentown, but I can certainly imagine my families factory being converted to loft living spaces. Sally Would love to discuss this with you as my Father worked for the Posner Family for over 30 Years. Mr. & Mrs. Posner were often in our home. Last Name is Benowich Ed was my dad.